President Obama wants to map the human brain. What would we gain? University of Illinois neuroscientist Aron Barbey has mapped brain regions that contribute to general and emotional intelligence. The Obama administration recently announced a large-scale initiative to develop new technologies to "map" the complex neural circuitry of the human brain. 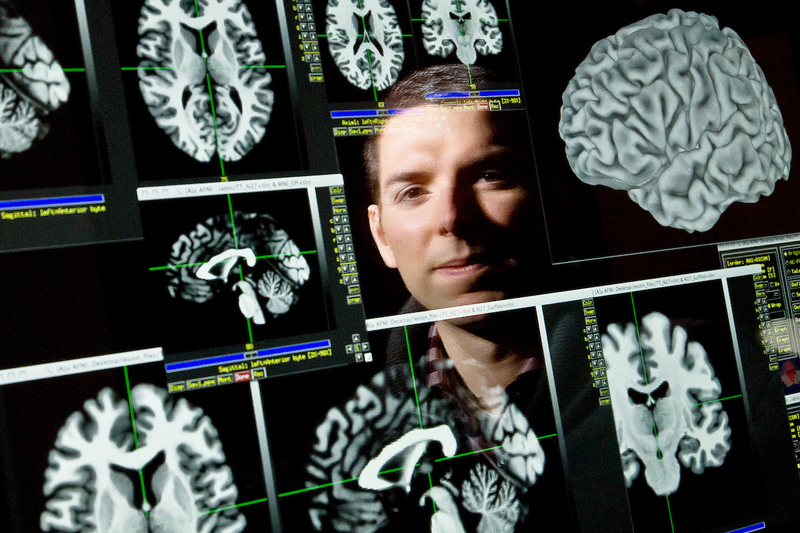 While the specifics of the program, called the BRAIN Initiative, are still vague, the goal is a worthy one, says University of Illinois neuroscientist Aron Barbey, who has himself mapped brain regions that contribute to general and emotional intelligence. Barbey spoke to News Bureau life sciences editor Diana Yates. Are we well on our way to understanding the brain and its role in behavior and thought, or have we just scratched the surface? Recent decades have seen remarkable progress in understanding the brain, with each breakthrough leading to new paths of discovery and ways of thinking about the nature of the human mind. Refined approaches to understanding the mind have been driven by greater sophistication in how we design experiments, analyze statistical data and measure the underlying neural, hormonal, cellular and genetic mechanisms. Beyond further precision in these respects, the study of the human mind has benefited from a multidisciplinary approach that investigates how the brain supports the spectrum of mental activities across a broad range of contexts - including how mental capacities emerge through evolution and development, are cultivated through experience, shaped by society and culture, and are altered through psychiatric illness and neurological disease. As the significance and scope of these issues would suggest, many fundamental questions about the nature of the human mind remain to be explored. We've only just begun to identify and piece together the deep and mysterious constellations of the human mind. Why is it so difficult to understand the human brain? The scope of the problem can be difficult to fully appreciate. Imagine holding a human brain in the palm of your hands. It is a soft, jelly-like lump of flesh that weighs about 3 pounds. But it can contemplate the vastness of interstellar space, the meaning of infinity, ask questions about the meaning of its own existence and about the nature of God. The brain is truly the most amazing thing in the world. And so our challenge is to understand the greatest mystery of human existence: What does it mean to be human? How does the mind emerge from the physical architecture of the brain? How does human experience and understanding come about? What kind of "new technologies" can you envision that would help answer the big questions about how the brain works? We need further precision for measuring structural and functional brain properties and more powerful statistical techniques for "seeing" patterns in the data. Like astronomers peering into space, we need better telescopes to identify galaxies just beyond sight and we need more powerful approaches for mapping the cosmos and navigating beyond the frontiers of our current understanding. In your most recent studies, you worked with brain-injured veterans whose injuries taught you a lot about the brain structures that are important to general and emotional intelligence. Does this research help these patients? It is not only our understanding of what it means to be human that is at stake for cognitive neuroscience. Equally important are efforts to translate discoveries about brain function into concrete and powerful clinical applications. Our research contributes to this larger effort by helping to establish the role of specific brain networks in executive, social and emotional function. We then apply these results to predict and explain the symptoms and behaviors of patients with psychiatric illness and neurological disease, and to develop targeted therapeutic interventions that attempt to remediate impairments in executive, social and emotional brain systems. Our goal is always to help our patients and this - even beyond questions about the nature of the human mind - motivates us to sleep less, think harder, dig deeper and find solutions that promote quality of life and reduce suffering. Why should the nation spend so much money on basic research into the workings of the brain? Simply stated, because all of our problems and our potential for progress as a human race are tied to the brain. Everything that we do as individuals and as a society originates in the human brain. Understanding how the brain works will help us understand why people think and behave the way they do - both in cases of profound virtue and insight, and in cases of dysfunction and disease. The great promise of cognitive neuroscience is that we could use this information to predict, explain and potentially shape human thought and behavior. We could also design artificial systems based on the architecture of the brain that approximate human abilities and support further discoveries and technological advances. The implications of cognitive neuroscience for our future are profound and raise important ethical questions about how neuroscience research should be used to inform these issues. But it is clear that unraveling the mysteries of the human brain is an enterprise that holds great promise for understanding the nature of the human mind - peering further into the celestial space of what it means to be human and finding new ways to envision and create a better future.